In 1943, Andrew Z. Adkins, Jr. joined the 80th Infantry Division, then undergoing its final training cycle in the California-Arizona desert. Upon reaching the division, 2nd Lieutenant Adkins was assigned as an 81 mm mortar section leader in Company H, 2nd Battalion, 317th Infantry Regiment. In 1943, Andrew Z. Adkins, Jr. joined the 80th Infantry Division, then undergoing its final training cycle in the California-Arizona desert. Upon reaching the division, 2nd Lieutenant Adkins was assigned as an 81 mm mortar section leader in Company H, 2nd Battalion, 317th Infantry Regiment. When the 80th Infantry Division completed its training, it was shipped in stages to the United Kingdom and then on to Normandy, where it landed on 3 August 1944. Adkins went on to fight in a succession of bloody battles across France. The unit suffered grievous losses as it took hills and towns away from brave German veterans. In the course of fighting, graphically portrayed in this soldier's memoir, Andy Adkins acted with remarkable skill and courage, placing himself at the forefront of the action whenever he could. His delivery of critical supplies to a unit in an embattled French town earned him a Bronze Star Medal, the first such award in his battalion. You Can't Get Much Closer Than This is at heart a young soldier's story of war. In vibrant, piercing terms, it tells of a junior officer's coming of age, and with page after page of action sequences, it gives insight into what modern warfare is really all about. It is a fascinating account to read of a junior officer learning his trade in difficult circumstances, but where he earned the respect of his men. 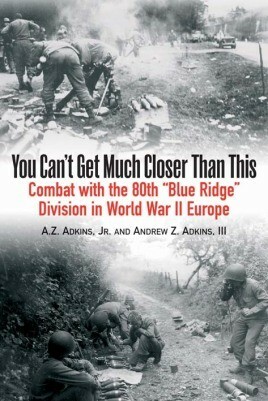 A personal record like this is a valuable resource to anyone interested in the period and made available to us thanks to his son, Andrew Adkins III..
We get a vivid picture of what it was like to be under fire at the front line...This is a very moving account of the fighting.